For those who collected back in 2001, they'll remember the excitement of baseball card products that year. 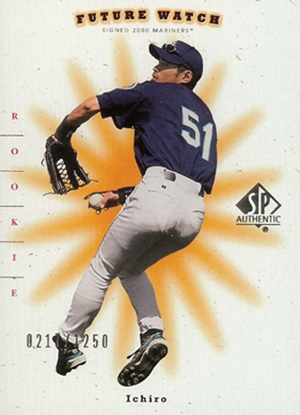 Ichiro Suzuki rookie cards played a huge part in that push, and his continued success meant collectors never stopped looking for his 2001 MLB cards. Alongside Albert Pujols, the pair had their first cards released throughout 2001. Demand was further increased as neither had prospect cards years in advance like we see today—at least MLB cards printed for North American audiences. 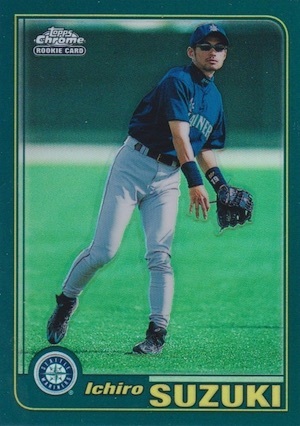 Ichiro did have several Japanese cards ahead of his arrival in Seattle, but they're not considered by most to be mainstream cards. Ichiro and Pujols weren't completely exclusive to one brand, either. It was a rare occurrence, indeed. Shop for Ichiro 2001 Rookie Cards on eBay. 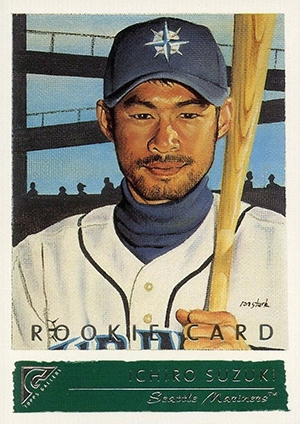 By the time the final 2001 baseball card sets were released, Ichiro Suzuki had more than 40 rookies and plenty of inserts. Although the Japanese legend's career is winding down, Ichiro Suzuki rookie cards are still tremendously popular. Below are our picks for the top Ichiro rookies. While value played a role in the selections, it's not the lone criteria. Rankings can be subjective, but we feel all of these cards are worthy additions to any collection. Click on the card listings or images to shop for singles on eBay. 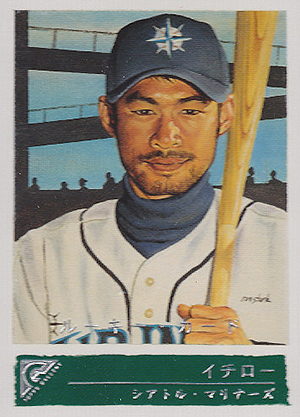 The art-focused 2001 Topps Gallery Ichiro Suzuki has a painted image that makes it stand out from all of his other cards. Inserted in packs as a redemption, it comes in two different versions: English and Japanese. However, both were printed in equal quantities. For those who can't afford the high-end Ichiro Suzuki rookie cards, 2001 Topps Chrome Traded represents a more affordable alternative. It's a quality chromium card that doesn't rely on bells and whistles. The Refractor parallel is also very popular. 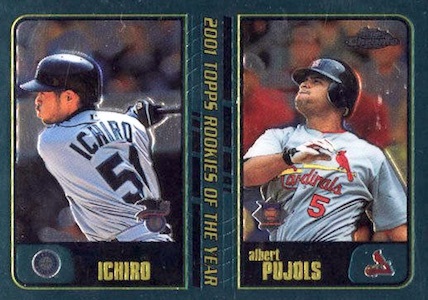 In addition, Ichiro is paired with Albert Pujols on another card in the set (#T99). This UD card is just one of two Ichiro rookies to have a jersey swatch. Further fueling the card's appeal is the low print run of 500 copies. The Pros & Prospects brand never really caught on for Upper Deck, though. So while this is still a desirable card, it doesn't command the attention it might if it were from a different set. Since its inception, the E-X brand (or whichever name it took on) could be counted on for unique cards done with different materials. 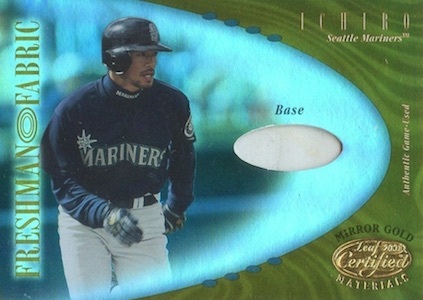 The 2001 E-X Ichiro Suzuki has a layered look with his image on top using a piece of acetate. Between him and the Mariners logo underneath are some sparkles. It may sound strange, but it works. 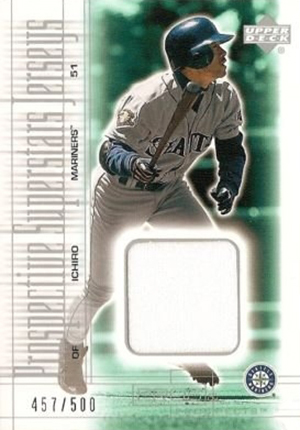 A card that makes the list more because of its rarity than visual appeal, the 2001 Leaf Certified Materials Ichiro Suzuki has just 200 copies. Out of the numbered cards, that makes it the second-rarest option. Rather busy, the design has a lot going on with swirls, horizontal text, vertical text, waves, and an oval game-used base piece in the middle of the card. The Mirror Gold parallel, numbered to 25, is shown below. It's not the rarest Ichiro Suzuki rookie, but it's one of the most popular. It just goes to show how powerful branding can be in the hobby. With a print run of 1,250 copies, it appeals to set builders, rookie collectors and Ichiro fans. 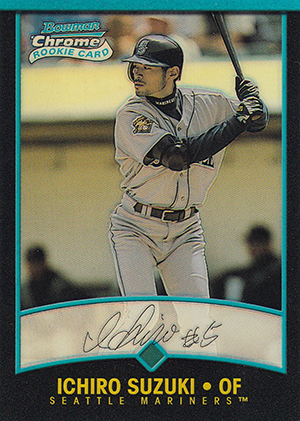 That said, supply for the 2001 SP Authentic Ichiro Suzuki has long since dried up, making it a tough card to find now. The 2001 Bowman Chrome Ichiro Suzuki has a few things going on. First, all 2001 Bowman Chrome rookies are done as Refractors, helping them stand out a little more. They're also short prints, so any given card is somewhat tough to pull. 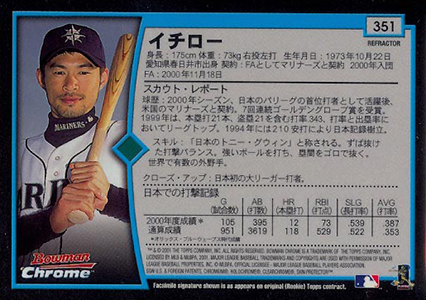 Like the 2001 Topps Gallery Ichiro rookie, there are two versions as the variation features Japanese text on the back. 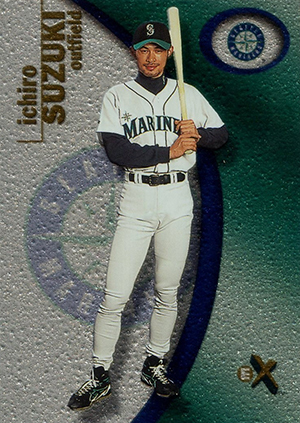 Despite not being numbered, this ranks among the most valuable Ichiro Suzuki rookie cards. 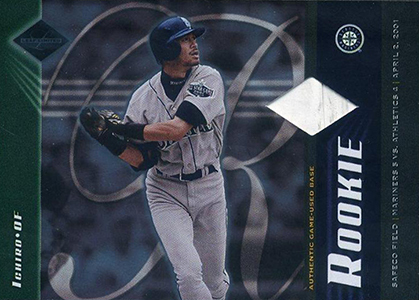 The 2001 Leaf Limited Ichiro Suzuki rookie lives up to its name. Numbered to 100, this is by far his rarest rookie card and it has a small piece of game-used base. However, the extreme rarity might actually work against the card a little as so few people actually have a chance to own it. But that's still somewhat relative and it generates a lot of attention on the rare occasions that one does surface. If you want the most valuable Ichiro Suzuki rookie card, look no further. 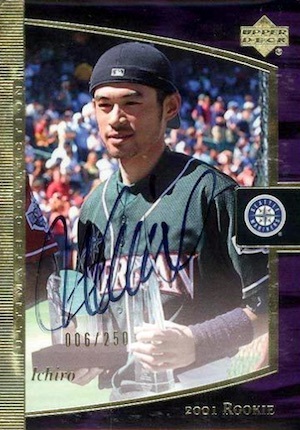 The 2001 Ultimate Collection Ichiro Suzuki card from Upper Deck is one of just two signed rookies of the Japanese superstar. With a print run of only 250, it's also extremely scarce. 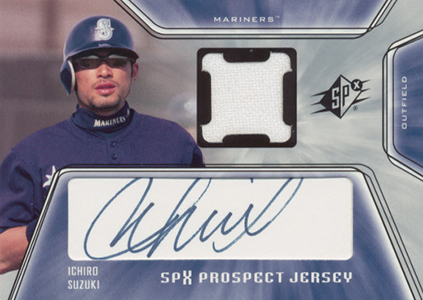 When it comes to Ichiro Suzuki rookie cards, 2001 SPx is his most iconic. It's his only rookie to deliver both an autograph and a jersey swatch, something that was rare at the time. Although not as valuable as his Ultimate Collection card, it's still extremely popular. The SPx rookie card is not numbered but is definitely more readily available than the Ultimate Collection autograph. It's this availability that actually helps the card's standing. It was perceived as more attainable so it caught the attention of the hobby. It was also his first autograph card, arriving to a very hot market. ICHIRO ROOKIE JERSEY 500 2001 UPPER DECK PROS & PROSPECTS #136 PSA 10 NICE!